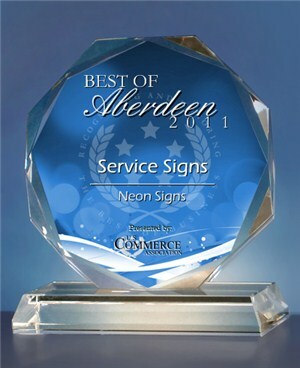 SERVICE SIGNS provides installation for Retailers and Sign Companies. From start to finish on time and on budget. , inspected, and installed . Leave the work to the sign installation experts. NEW YORK, NY, October 26, 2011 -- Service Signs has been selected for the 2011 Best of Aberdeen Award in the Neon Signs category by the U.S. Commerce Association (USCA).